Two forms, lodged with the Register of Scotland on 13 January, have restored the turmoil to the Rangers saga. They are advanced notices of loan securities being lodged against Ibrox and Murray Park by Sports Direct, and to the club's fans they are incendiary. That in itself is significant. There will clearly now be no attempt by Mike Ashley, the owner of Sports Direct, Newcastle United and the holder of an 8.29% stake in Rangers, to try to win the Ibrox support over. That indicates either a disregard for the importance of the fans - a policy that has not hindered the way that he runs Newcastle - or merely short-term planning. Businesses borrow money using their assets as security as a matter of course. It is normal business practice, but the situation at Rangers is anything but ordinary. Ibrox is the club's home, it is symbolically important to the fans, and emotionally significant too since the victims of two disasters at the stadium continue to be commemorated. Feelings were raw amongst the support anyway. The club is in a perilous financial state and an offer of funding from a consortium led by Lanarkshire businessman and lifelong Rangers fan Douglas Park has not been accepted. Following the withdrawal from the fray of US investor Robert Sarver, the Rangers board has a straight choice between accepting money from Park or Ashley. Now, though, the board has effectively ceded control of the process to Ashley. That is the key aspect to the latest developments, and the most significant effect. The advance notice ensures that only Sports Direct can successfully lodge securities against the two properties for a period of 35 days. So in that time, any loan provided by Park's group would have to be unsecured, or Sports Direct would need to agree to the advance notice being withdrawn. So Ashley now has the final say on how Rangers are financed. There is little time for negotiation, since the club does not have enough money to meet January's wages. Sports Direct have offered £10m in return for security over Ibrox and Murray Park, while Park's group offered around £5m in return for security over Murray Park. Rangers First:"Rangers First is extremely concerned about the fact that one party has been granted advance notice of security over assets including our stadium and Auchenhowie at a time when the company which owns our club has assured shareholders it is currently considering various proposals." Rangers Supporters Trust:"Quite frankly this latest move by the board is legalised theft and we will not stand by and watch it happen. If necessary we will instigate legal action against the directors both collectively and individually. We have also contacted several MPs and will be seeking political and government support to stop this attempted asset grab." Ashley has a £3m loan due to be paid back in April, but the Park group's funding would just be the first step towards a share issue to raise further funds. The Newcastle owner had intended to underwrite the share issue, but the Scottish Football Association rejected his request to raise his shareholding above 10%, due to his involvement with the St James' Park club. So Ashley has short-term control, which he had to an extent anyway because his associates Derek Llambias and Barry Leach took executive positions at the club following the £3m loan late last year, but what next? Immediately, there will be further opprobrium from the Rangers fans. A protest is being planned for before the Championship game against Hearts at Ibrox, and crowd sizes are likely to fall further. Ashley, Llambias and Leach are operating with a calculating disregard for the affect of their actions on the fans, but they are also further isolating the chairman David Somers, the Rangers International Football Club non-executive director James Easdale and The Rangers Football Club board member Sandy Easdale, who the fans will consider as being complicit to Ashley's moves. The Rangers Supporters Trust is also seeking legal advice on behalf of shareholders. With Llambias being a long-time associate of Ashley, and Leach having left his position as a Sports Direct executive to take the role at Ibrox, there could be related party transaction issues to be challenged by shareholders. Somers also insisted in a statement last year that the board would never grant security over the stadium. Shareholders could call an extraordinary general meeting, with resolutions to remove board members, and Ashley's move will only further alienate shareholders who were already against the regime. Park, George Letham and George Taylor own 20% of the shares, while Dave King now owns almost 15%, and with interests held by Rangers fans taken into account, there is a significant bloc opposed to the current board, and that is likely to be enough to win an EGM. Park, Letham and Taylor wanted to provide a loan, to be converted into equity, in return for seats on the board. Ashley's move, made in conjunction with the board, has blocked them. Ashley could be loading the bases, so that once control changes hands, the new directors must immediately find the funds to pay back his £3m, or his £13m, depending on how the funding needs are addressed. Ashley has consistently ridden roughshod over the feelings and wishes of the Newcastle support. The situation at Rangers is different, though, and one that he has shown no signs, publicly or privately, of understanding. The media scrutiny, the political ramifications, the reach and depth of the Rangers support, are all of a different order of magnitude than Newcastle fans griping about how their club is run. More crucially, Ashley owns Newcastle, but only controls Rangers because of the support of the current board and the loans he has provided. 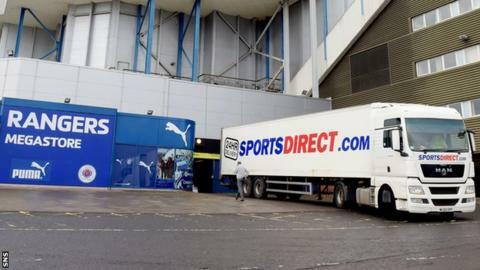 Sports Direct are partners in a joint venture with the club, called Rangers Retail, in a deal that provides much of the uplift of Rangers merchandising revenues to Sports Direct. That has been estimated to be worth around £4m to Ashley, but it also reduces the amount of income to the club. If Sports Direct loan Rangers £10m, how will that amount be paid back, not least because the 15,000 fans who did not renew their season tickets last summer are only likely to be joined by more disaffected fans if the current board stays in place. The latest move raises further questions and concerns for the Rangers fans, but it is not a conclusive development.